After Willie comments on Miss Kay's hoarding tendencies this week on Duck Dynasty, airing on the Outdoor Channel on February 1 at 7:00 pm, she and the women hold a yard sale and sell a few of the guys' treasured possessions out from under them, including Phil's favorite chair. Willie also talks Phil into giving up one of his old duck blinds, and the guys blow it up to build a new one using an old RV outside Phil and Miss Kay's house. A line of camo-clad hunters snaked down the aisle as Jase Robertson and his father Phil weaved their way through the crowd. Duck Commander had just gotten its merchandise into Walmart and their "Duckmen" videos, among the first in the fledgling hunting video industry, were starting to gain a following. The two men were working a hunting show in Memphis at the time, selling calls and gear in an effort to grow their business. Making their way down the line, they quietly wondered what could draw such a large crowd? When Phil and Jase neared their booth, it dawned on them: Those hunters were lined up to see the men of Duck Commander. "I remember working these shows before our videos started selling and just watching people walk past us. We'd blow our calls to get their attention and try to get them to come over and take a look," recalls Jase, whose book, Good Call: Reflections on Faith, Family and Fowl, was published in 2014. "Our videos made us minor celebrities. Since then, the line never went away." The Duck Commander family has made a tremendous name for themselves over the years. But they haven't forgotten their roots and the places that made them who they are today. Jeff Simmons, owner of Simmons Sporting Goods in Bastrop, Louisiana, knew the Robertsons when the family was scraping by on money they made as commercial fishermen and small-time duck call makers long before they became household names. They hunted together some and helped each other's business at every opportunity. "We started our businesses about the same time, so they spent a lot of time at my store promoting their calls and videos. They were always good people. Phil helped me every chance he could and I did what I could to help them. I still sell their calls. They are some of my best-sellers," says Simmons, who has known the Robertsons for over 35 years. Young Phil Robertson pictured here working hard in the factory. He didn't realize at this time that his calls would change the waterfowl industry forever. Before Phil ever toyed with the idea of starting his own call company, he spent his spare time modifying the few calls that were available back then. Simmons says he and Robertson and most other duck hunters he knew used a black plastic P.S. Olt. It was, recalls Simmons, difficult to blow, although it did have a good sound. "We were all trying to modify those Olt calls to make them easier to blow, but Phil took it a step further," says Simmons. "He really was a pioneer. He made a call that was not only easy to blow, but that really sounded like a duck. Anybody could use one and kill ducks." Despite the positive reviews from the few hunters that tried them, things didn't go so well for Duck Commander the first year the Robertsons went into the call business. Phil sold just $8,000 worth of calls, making about a dollar per call, according to his book, Happy, Happy, Happy. Business picked up a bit the following years, though. The family fine-tuned their call making methods and hit the sales circuit even harder. They made $35,000 their fourth year and more than $100,000 by their tenth year. Phil Robertson striking a pose while making the hand-crafted, highly-effective, Duck Commander calls that have enabled his family to become the most successful duck hunting brand there is today. "We knew there was potential. That line at the show in Memphis was a light bulb moment for me," says Jase. He was a natural salesman, but in the beginning all the Robertsons pitched in to promote Duck Commander and its products. They hunted hard for much of the season and then shaved their beards and traveled throughout duck country hawking the company's videos and calls. Eventually, younger brother Willie took the lead role in running the business, while Jase, Jep and Allan each took different duties. "I just like to build calls. I like the challenge of taking the parts and putting them together and making a call sound just right so that it fools ducks," says Jase. "I'm still involved in that end of the call business." He admits he was a reluctant participant in the Duck Dynasty franchise at first and he had little faith it would turn out to be such a hit. Worse, the show's producers had scant interest in the Robertsons' passion for hunting, even though that (and their faith) is what defined them. It still does. "When we were approached about doing this show, we all sat down as a family and made some rules. First, we were going to be ourselves. Second, we would not make any attempt to hide our faith and we would not give up our hunting season," says Jase. "(The show's producers) didn't understand why we wanted to do that." Jase Robertson, the son of Phil, knew if he wanted to make it in the business, he would have to spend a lot of time learning. He makes sure that every call is hand-tuned. This part of the business is very important to Jase because he knows waterfowl hunters want the best calls possible, and it is his ambition to give them what they want. The family didn't budge. Their deal with the A&E network includes an eight-week hiatus that runs through Louisiana's duck season. Jase hunts every day, including an hour before church each Sunday, no matter what the weather. So do the other Robertson men. 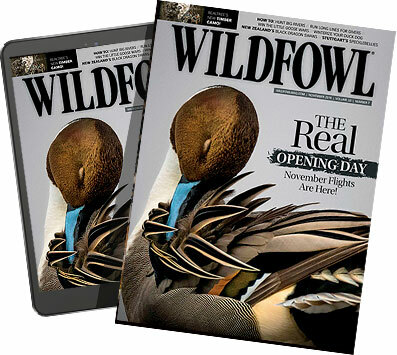 Virtually all of their hunting takes place on their parents' land, despite a near-constant invitation to hunt some of the best duck marshes in the world. Stardom rarely allows them to accept those offers. "We can't go anywhere without being recognized. It's difficult to hunt when people just want to talk or get your autograph," he says. "We do try to go to Arkansas or Missouri or Kansas during the Louisiana split, but we keep a low profile because we just want to hunt." A self-described generalist, he's not hung up about shooting greenheads or even killing a limit. He'll take whatever he can get, but he admits he's not a big fan of shovelers or blue-wing teal because he doesn't care for their flavor. Other ducks rank high on his list, though. "Grilled, gumbo, whatever. I really like to eat duck," he says. Mostly, he just loves what he calls the competition between him and the ducks. Success comes from blowing the right notes on a call he designed and using the right decoy spread to coax birds out of the sky and onto the water. At 45, he's less interested in pulling the trigger than simply sharing a duck blind with his family and friends. One of his most memorable hunts didn't produce a single bird. It was just him and his uncle Si. Uncle Si (left) and Phil Roberston (right) prowl the shallows of frigid water as they head to their duck blind. "We never fired a shot, but he's always fun to be around," he says. All of the Robertson men are skilled duck hunters, but Simmons says Phil in particular has a special knack for killing ducks, which likely comes from a lifetime of experience in a blind. It also comes from persistence. "He will stay out there until he kills his ducks. It doesn't matter if the birds are flying or not, he's going to stick it out," says Simmons. You wouldn't know it from watching Duck Dynasty, which only occasionally shows the Robertson men with a gun in their hands. Although it's impossible to prove, the recent increase in duck hunting participation is credited by some to the popularity of Duck Dynasty. Young, bearded and face-painted hunters are an increasingly common sight at boat ramps during duck season, many of them sporting new equipment. "Maybe the show had something to do with that, maybe not, but it does seem like there are more people duck hunting these days. Anything we can do to put show the sport in a positive way is a good thing," says Jase. "The more hunters there are and the more people who view hunting favorably, the better. Some hunters don't want the competition and I understand that. I've been there, but we are outnumbered, so we could lose our hunting rights, but it's our responsibility as duck hunters to educate those people. It's crazy to say more hunters is a bad thing." John Godwin, is the one of the few full-time workers outside of the Duck Commander family. Some of his duties include building duck calls, managing supplies, and overseeing the shipping department, but when duck season rolls in, his main priority is decoy technician . Call People for the Ethical Treatment of Animals "crazy." The anti-hunting group urged A&E to cancel the show, calling the cast "serial animal killers." Their pleas were ignored. They've been called religious zealots and bigots, as well, but just as Jase brushes off the attacks by anti-hunters, he pays little mind to even the harshest critics. Why should he? Although total viewership has slipped, Duck Dynasty continues to sit at the top of the ratings. Already in its eighth season, it remains the highest-rated original show on cable television. One episode last July drew more than 2.1 million viewers, nearly three times the total primetime line-up of MSNBC. All of the Robertson men have written at least one book. Their wives collaborated on a book, as well, and the sale of Duck Dynasty merchandise continues to provide the Robertsons additional income. Willie also co-hosts the Outdoor Channel's Buck Commander TV with current and retired baseball players and country singers Jason Aldean and Luke Bryan. The show revolves around deer hunting, but in some ways, it's similar to Duck Dynasty. It revolves around hunting, but it includes the relationships of the hunters and the fun they have on their hunts. It doesn't have the massive following of Duck Dynasty, but it's popular enough on the Outdoor Channel. There are no plans announced for a duck hunting show similar to Buck Commander, but Jase admits he doesn't know what the future holds. He doesn't seem too worried, though. "I know we reach a lot of people that are just like us and I realize we are able to do a lot of good through our show," says Jase. "We are involved in the Make-A-Wish Foundation. We bring in five to ten families and we spend the day with them building a call and hanging out. However, none of us are scared to lose the fame and the money if the show went away. We're still going to hunt and we will still be family when it's over. Doing this show has only brought us closer together."